the first step before you do anything else is to cop up a pint of strawberries (about 8oz) and add about 3/4 cup of sugar to them. let them sit in the fridge mixed into the sugar for at least 20 minutes (overnight is good too) so then can absorb the sugars and make a strawberry simple syrup. then mash them by hand or throw them into a blender. you will then use this puree for both the cake and the frosting. stir together the flour, sugar, baking powder & soda and salt. mix the oil, strawberry nectar, and vanilla extract into the bowl containing the soymilk and vinegar and then slowly add the wet ingredients to the dry ingredients and blend. add strawberry puree and continue to blend. scoop into cupcake wrappers. these will puff up a lot...more than most of the non-vegan cupcakes i make do. past vegan recipes i've made have ended up pretty flat, so as a caution i filled the wrappers almost to the top and got a really puffy dome top...so depending on what you are going for about 3/4 full is great. bake for 20 - 25 minutes until starting to brown. bring cream cheese and butter to room temperature and beat together until creamy. add 1/2 cup strawberry puree. add powdered sugar, 1 cup at a time, until desired sweetness and texture. you may want to add more puree to get a stronger flavor. i ended up using at least a cup i think, but it made for less firm frosting, so if you are concerned with having the frosting be able to be piped on, you may want to go easy on the puree. if you want to thin things out, just use some of the strawberry nectar. if you do not care to make this vegan, just use real butter and cream cheese...the effect is the same. i was really happy with the results! i am not going to tell you that i think my vegan cupcakes are 100% as good as my cupcakes with egg and all the things i am used to using...there is definitely a different texture involved, but i think these were pretty darn good. 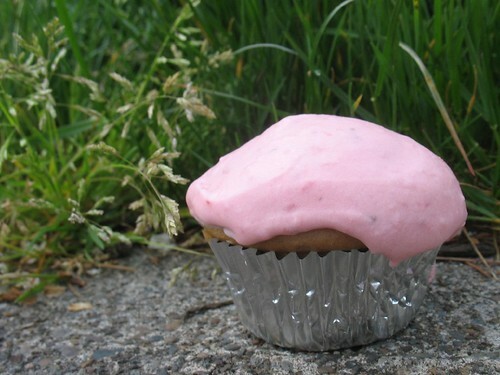 i will absolutely make some version of the strawberry cupcake again in the next few months once it is officially strawberry season! Thanks for the tip about Bath and Body Works I have a new store near me but haven't been there yet. I love your recipes too. this sounds good, how many cupcakes does this recipe make? Sweet, literally! lol It looks very good. Great, now I have a sweet tooth. some freebie tips for the day. tooth pain and a lovely weekend.